Installation of pipe 46+25RT to 46+46RT. PCC sidewalk and base for brick sidewalk at stations 25+33RT to 25+63RT. Excavation of roadway for pipe connecting CB-18 to EX-MH. Station 141+89LT to 141+75RT. The Contractor (Capitol Paving of DC) continued to work along the eastbound side of Kennedy Street NW and the started work on the westbound side also, between the intersections of Illinois Ave NW and Kennedy Street NW to 3rd Street and Kennedy Street. The contractor furnished and installed two (2) double catch basins, and about 31 feet connecting drain pipes. The Contractor also installed four (4) PCC bicycle/wheelchair ramps. Also, Capitol Paving furnished and installed 48.5 feet 8” X 12” granite straight curb and 83 square feet of Brick Gutter. The contractor laid about 237 square feet of brick sidewalk on PCC base. Besides, the contractor poured 364 square yards of concrete for PCC Sidewalk 4 Inch. The Contractor (Capital Paving of DC) continued to work along the eastbound side of Kennedy Street NW, between the intersections of Illinois Ave NW and Kennedy Street NW to 4th Street and Kennedy Street. The contractor furnished and installed 3 double catch basins, and 39 feet connecting drain pipes. The Contractor also installed 6 PCC bicycle/wheelchair ramps at the intersections of 9th and 5th Street with Kennedy Street NW. Also, Capital Paving furnished and installed 61 feet 8” X 12” granite straight curb, 15 feet 8” x 12” granite circular curb, and 153 square feet of Brick Gutter. 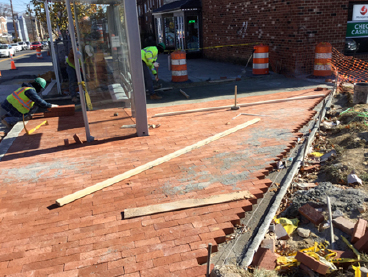 The contractor was able to lay 304.59 square feet of brick sidewalk on PCC base. Besides, the contractor poured 240 square yards of concrete for PCC Sidewalk 4 Inch. The contractor also poured concrete for the bus pad at Kennedy Street NW and 7th Street NW intersection.